1. 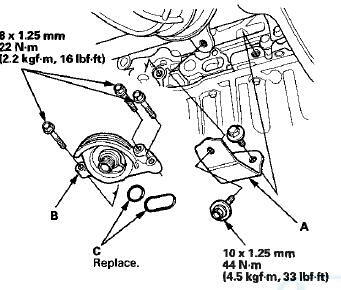 Remove the oil filter (see page 8-12). 2. Remove the exhaust pipe bracket (A), then remove the oil filter base (B). 3. Clean the O-ring grooves and the mating surface with the oil filter base. 4. Install the oil filter base with new O-rings (C). 5. Install the oil filter (see page 8-12).